Objectives To synthesise evidence on the acceptable identification and initial response to children’s exposure to intimate partner violence (IPV) from the perspectives of providers and recipients of healthcare and social services. Design We conducted a thematic synthesis of qualitative research, appraised the included studies with the modified Critical Appraisal Skills Programme checklist and undertook a sensitivity analysis of the studies scored above 15. Data sources We searched eight electronic databases, checked references and citations and contacted authors of the included studies. Eligibility criteria We included qualitative studies with children, parents and providers of healthcare or social services about their experiences of identification or initial responses to children’s exposure to IPV. Papers that have not been peer-reviewed were excluded as well as non-English papers. Results Searches identified 2039 records; 11 studies met inclusion criteria. Integrated perspectives of 42 children, 212 mothers and 251 professionals showed that sufficient training and support for professionals, good patient-professional relationship and supportive environment for patient/clients need to be in place before enquiry/disclosure of children’s exposure to IPV should occur. Providers and recipients of care favour a phased enquiry about IPV initiated by healthcare professionals, which focuses on ‘safety at home’ and is integrated into the context of the consultation or visit. Participants agreed that an acceptable initial response prioritises child safety and includes emotional support, education about IPV and signposting to IPV services. Participants had conflicting perspectives on what constitutes acceptable engagement with children and management of safety. Sensitivity analysis produced similar results. Conclusions Healthcare and social service professionals should receive sufficient training and ongoing individual and system-level support to provide acceptable identification of and initial response to children’s exposure to IPV. Ideal identification and responses should use a phased approach to enquiry and the WHO Listen, Inquire about needs and concerns, Validate, Enhance safety and Support principles integrated into a trauma-informed and violence-informed model of care. This is the first synthesis of qualitative studies focusing on the integrated perspectives of patients/clients and healthcare and social service professionals on the acceptable identification and initial response to children’s exposure to intimate partner violence. We retrieved relevant studies through a comprehensive search strategy, including electronic searches, citation and reference checking and contacting experts. Involvement of two reviewers throughout screening, data abstraction and critical appraisal of each study ensured methodological rigour of this review. Reviewers’ backgrounds in different disciplines broadened and enriched the interpretation of data. Thematic synthesis allowed us to: (i) integrate perspectives of all participant groups and generate new interpretations going beyond the findings from primary studies, (ii) identify gaps in evidence within and across participant groups; (iii) establish areas of conflicting perspectives, which can be targeted in future research and interventions. Exclusion of non-English papers and non-peer-reviewed reports could result in missing some relevant studies; methodological limitations of the included studies weakened the reliability and objectivity of the evidence. What approaches to identification of children’s exposure to IPV are acceptable to children, non-abusing parents and professionals? What initial responses to children identified as being exposed to IPV are acceptable to children, non-abusing parents and professionals? We aimed to retrieve relevant studies in the field through a comprehensive search and sampling strategy,19 building on an earlier review by Howarth et al in the IMPRoving Outcomes for children exposed to domestic ViolencE (IMPROVE) 2013 evidence synthesis.20 First, we retrieved full-text reports assessed in the IMPROVE synthesis. Second, we re-ran IMPROVE searches (28 April 2016) in eight medical, social science, social care and nursing databases (Ovid MEDLINE, PsychINFO, The Cochrane Library, Embase, Web of Science Social Sciences Citation Index, Web of Science Conference Proceedings Citation Index- Social Science & Humanities, Social care online, CINAHL on EBSCO) (see online supplementary file 1). Finally, the first reviewer completed forward and backward citation chaining of all included papers and emailed corresponding authors of the included papers (12, 24 August 2016) asking to confirm peer-reviewed status of reports and signpost to additional relevant papers. Inclusion criteria are summarised in table 1. Multiple papers from the same study were included if they each reported new data relevant to the research questions. Exclusion of non-English papers and papers that have not been through the formal peer-review system (eg, books, conference papers, editorials, letters, general comment papers) was justified by limited resources and concerns about validity and reliability of non-peer-reviewed sources, respectively. Two reviewers independently screened titles and abstracts of all references. The first reviewer screened all full-text papers, the second reviewers screened a 10% subset and disagreements (27%) were resolved through discussion and consensus. We adapted a data extraction form from IMPROVE.20 The first reviewer extracted study details; second reviewers checked the extracts. The papers were then treated as primary text transcripts. Where studies included varied participants, only data relevant to our inclusion criteria were considered. Two reviewers independently extracted raw qualitative data25 relevant to the views and direct experience of identification and initial response to children’s exposure to IPV from ’Results' section of the included papers. These data could be in the form of participants’ quotes or authors’ interpretations of participants’ voices. For each study, the reviewer entered data extracts into the form separately for children, parents and professionals. Line-by-line coding alongside data extraction. Two reviewers independently coded the data extracts for themes relevant to the acceptability of the identification approach and initial response to children’s exposure to IPV29 subsequently meeting to compare and combine their codes. The first reviewer produced a final table of codes with supporting verbatim text for each participant group in each study. Developing descriptive themes. The first reviewer grouped the codes into themes and subthemes with accompanying verbatim to capture consistency and range of views within each participant group and across the studies.29 Second reviewers commented on the table leading to the final version. Generating analytical themes. The first reviewer used the constant comparison method30 to integrate perspectives across child, parent and professional groups. The integrated stakeholder perspectives were categorised by level of agreement within and across the groups.31 When perspectives on a theme were consistent, it was categorised as convergent. When stakeholders’ views on a theme were consistent within groups, but differed between them, it was categorised as divergent. Finally, themes with wide variation, within and between the groups, were categorised as conflicting. This integration through categorisation produced interim analytical themes which were further refined in relation to the research questions. Our approach allowed us to: (i) integrate perspectives of all participant groups and generate new interpretations beyond findings from primary studies, (ii) identify gaps in evidence within and across participant groups and (ii) establish areas of conflicting perspectives, which can be targeted in future research and interventions. Throughout this stage, the first reviewer developed diagrams and tables with interim analytical themes, which were refined during group discussions at three meetings with all second reviewers. Patients and public were not involved in the design and conduct of this secondary analysis of published research. Sixteen papers reporting 11 studies were included (figure 1); three were reported in multiple papers. Two papers were from a study on parents’ experiences with Irish child protection services.32 33 Two papers drew on a study of police and children’s social services responses to IPV incidents where children were present or resided in the household.34 35 Four papers were from the Researching Education to Strengthen Primary care on Domestic Violence and Safeguarding (RESPONDS) study on general practice clinicians’ perspectives on child safeguarding in IPV cases.36–39 All papers were published between 2008 and 2015. Flow of studies through the review. 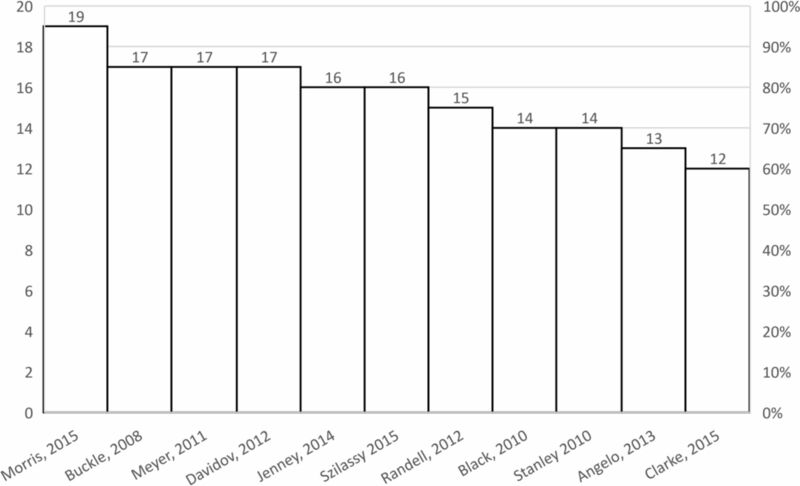 Of 11 studies, 7 studies30 39–44 scored ≥15 out of 20 on the M-CASP indicating their overall good methodological quality (figure 2, online supplementary file 3). The main shortcomings identified were in the M-CASP domains of reliability and objectivity. Thus, the authors did not justify their choices of study design,35 37 40 41 44 47 research methods,35 37 40–43 46 47 participant selection35 40 41 43 44 46 47 and recruitment.33 35 37 40 42 43 47 Only two studies41 45 described strategies for establishing neutrality. Methodological quality of the studies as assessed by the modified Critical Appraisal Skills Programme (score range 0–20). Studies scored≥15 are in the top tertile. Initial line-by-line coding generated 75 codes. We grouped them into 22 descriptive themes with 13 subthemes related to: (1) experiences of identifying children’s exposure to IPV; (2) experiences of the initial response to children’s exposure; (3) factors enabling identification and initial response to children’s exposure; (4) reasons for not identifying or disclosing children’s exposure or not engaging with services; (5) psychological consequences of individuals’ involvement in identification and initial response to children’s exposure and (6) suggested training and resources (see online supplementary file 4). All relevant parents’ quotations were from mothers who had experienced IPV. Conflicting perspectives on engagement with children and management of safety (table 3). Not all participant groups contributed equally to the final analytical themes. Thus, professionals’ perspectives were presented across 15/17 subthemes, while mothers informed 13/17 and children 9/17. Children’s quotes were not available for most subthemes covering an acceptable initial response. Quotes from each stakeholder group supporting the final analytical themes are collated in the online supplementary file 6. Professionals receive sufficient training and guidance built on local policies on children’s exposure to IPV and interagency work with children’s social services and IPV services.37 41 42 Training fits into daily practice of HCPs and SSPs and prepares them to better communicate with children.37 Training and guidance clarify: (i) what constitutes children’s exposure to IPV, especially psychological and non-direct physical, (ii) what are professionals’ roles and reporting duties, (iii) how and where to document children’s exposure to IPV and (iv) how and where to signpost mothers and children.32 35–37 41–46 Training and guidance increase professional awareness, skills and confidence, which lead to more satisfactory identification and responses. Mothers, children and professionals receive emotional support and help with managing the emotional burden of involvement in identifying and responding to IPV. For patients/clients, such support is provided through non-judgemental responses and confidentiality (or being clear when reports must be made).32 34 35 43 45 For professionals, ongoing emotional support and supervision need to be arranged.35 37 41 47 This helps to maintain well-being and mental health of patients and professionals and leads to increased satisfaction. The acceptability of any work related to identification of and response to children’s exposure to IPV can be undermined by systems-level constraints, such as high demand on services, lack of resources and system support and poor interagency collaboration.35 37 40 41 Therefore, the approaches to identification and responses must be aligned with the capabilities of under-resourced healthcare and social services. Exclusion of four studies scoring <15 on the M-CASP 35 40 41 47 did not change the final analytical themes. This synthesis included 11 qualitative studies with 513 providers and recipients of healthcare and social services. We identified enabling precursors, ideal approaches and areas of disagreement among children, mothers and professionals regarding the acceptable identification and initial response to children’s exposure to IPV. Enabling precursor processes were linked to patient/client-professional relationship building, creating a safe and supporting environment and changing and matching responses according to individual mothers’ readiness to disclose and engage with services. Enabling conditions included sufficient training and multiple language-versions materials and embedding the work of identifying and responding to children’s exposure to IPV into the context of under-resourced services. Acceptable identification involved a phased approach to enquiry. An ideal initial response included emotional support, education about IPV and signposting to IPV services. Areas of disagreement were related to the acceptability of engaging directly with children and managing child’s safety. Another notable finding is the role of the wider context. Although most of the included studies were based in high-income countries, all professionals described how their ability to identify and respond to children’s exposure to IPV was heavily influenced by healthcare and social service systems constraints. Specifically, they felt they lacked time to engage with their patients about sensitive issues; they felt burdened by constant cuts and restructuring of healthcare and social services and they expressed frustration about poor access to referral pathways. These systemic factors were compounded by poor communication and coordination across organisations and absence of a single referral pathway, consistent with findings in research on child protection services.51 52 This highlights the importance of targeting interventions on identification and initial response to children’s exposure to IPV at both individual and system levels,53–55 with professional guidance adaptable to the changing landscape of local services. While not the focus of this synthesis, it is important to note that mandatory reporting of child maltreatment laws may complicate or intertwine with strategies for inquiring about exposure to IPV, as children’s exposure to IPV is a reportable exposure in some jurisdictions.74 75 We found that most HCPs were confused as to whether children’s exposure to IPV was reportable in their jurisdiction. They felt anxiety about the reporting duties and thresholds. This finding is in line with the recent meta-synthesis on mandated reporters’ experiences with reporting child maltreatment.22 The authors offer recommendations for mitigating potential harms associated with the reporting processes. The strategies include disclosing reporting duties and the limits of confidentiality when providers start a relationship, consulting with child protection services in an anonymous manner when a provider is unsure if the suspected maltreatment is reportable, and—if the suspected maltreatment is reportable—discussing with the child/family how the provider will file a report (when it is safe for the child to do so) and likely child protection service responses to the report. Discussing reporting duties and limits of confidentiality should ideally occur before inquiry, to minimise feelings of betrayal that may emerge when a provider realises they must report. These recommended strategies are applicable to the reportable children’s exposure to IPV. We used comprehensive strategies for retrieving papers, including systematic searches of bibliographic databases, citation searching, reference checking and emailing topic experts. Involvement of two reviewers throughout screening, data abstraction and critical appraisal reduced potential bias. Reviewers’ backgrounds in different disciplines broadened and enriched data interpretation. Bringing together perspectives of children, mothers and professionals gave the recipients of care a voice equal to the providers. Our analytical themes are easily understood and can be used by practitioners and policy makers as targets for interventions on identification and response to children’s exposure to IPV. This review has several limitations. Only papers published in English were included due to limited resources. This limitation alongside the exclusion of books and conference abstracts could result in missing studies relevant to the review questions. However, our decision to focus on papers that have been peer-reviewed and potentially of better methodological quality, increases the robustness of our findings. The evidence we produced should be interpreted with caution, taking into consideration the following limitations of the primary data. It is supported by only 11 studies from high-income and middle-income countries, 4 of which had methodological shortcomings regarding reliability and 9 were lacking objectivity. Some important information (eg, mandatory reporting status of professionals) was not specified. The selective nature of the stakeholders’ sample makes our findings relevant to HCPs and children’s social service providers, mothers who have experienced IPV and their children. All evidence supported by children’s voices came from two studies. Although small, the sample of children covered varied ages and settings. Future studies should explore children’s own experiences of encounters with healthcare and social services around identification and initial responses to IPV. Children’s voices will provide important information on their values and preferences. Future studies should also recruit fathers who have experienced IPV. Our fourth theme of conflicting perspectives should guide future research on the acceptable approaches to talking directly to children about IPV and undertaking risk assessment and safety planning. The authors would like to thank Dr Lisa Arai for performing the electronic searches and for helping with title and abstract screening. The authors are grateful to Khabo Piggott and Eleanor Wright who volunteered to help with data extraction, coding and critical appraisal.
. Intimate partner violence. In: Goldman L , Schafer AI , eds. Goldman’s Cecil Medicine. 25th ed. Philadelphia, PA: Elsevier Saunders, 2015.
WHO. Global and regional estimates of violence against women: prevalence and health effects of intimate partner violence and nonpartner sexual violence. Italy: WHO, 2013.
. WHO multi-country study on women’s health and domestic violence against women: initial results on prevalence, health outcomes and women’s responses. Geneva, Switzerland: WHO, 2005.
. Mothering through domestic violence. London; Philadelphia: Jessica Kingsley Publishers, 2006. Government HM. Working together to safeguard children. A guide to inter-agency working to safeguard and promote the welfare of children: HM Government, 2015. NICE. Domestic violence and abuse: how social care, health services and those they work with can respond effectively. London: NICE, 2014.
WHO. Responding to intimate partner violence and sexual violence against women: WHO clinical and policy guidelines. Geneva: WHO, 2013. PreVAiL. VEGA (Violence, Evidence, Guidance and Action) Project: a public health response to family violence. Secondary VEGA (Violence, Evidence, Guidance and Action) Project: a public health response to family violence. https://projectvega.ca/.
. Qualitative methods for health research. Third edition. Los Angeles: SAGE, 2014. CRD. 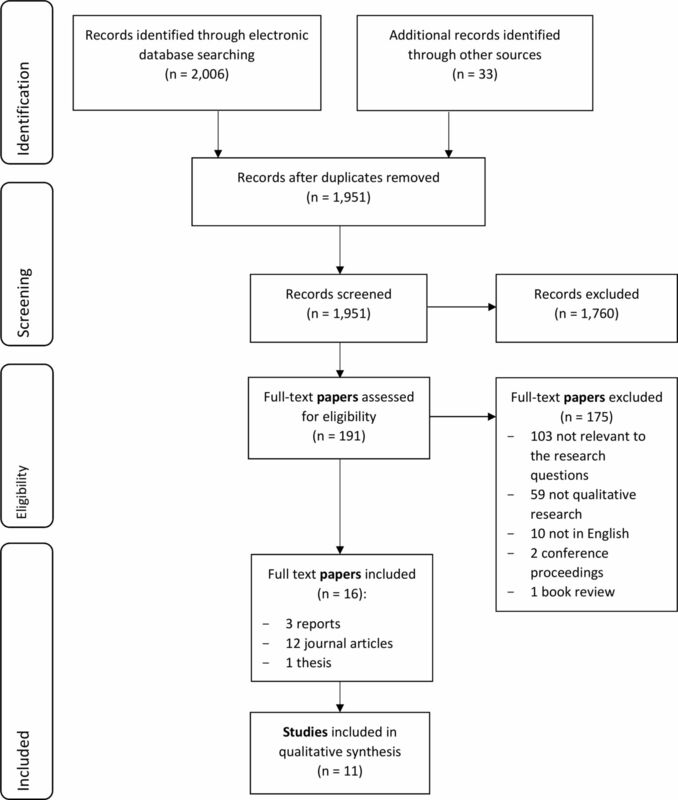 Systematic reviews: CRD’s guidance for undertaking reviews in health care. Dissemination CfRa D , ed. Centre for reviews and dissemination: University of York, 2009. CASP. Critical Appraisal Skills Programme. CASP Qualitative Research Checklist 31.05.13. Secondary Critical Appraisal Skills Programme. CASP Qualitative Research Checklist 31.05.13 2013. http://www.casp-uk.net/checklists.
. Synthesising qualitative research: choosing the right approach. Chichester, West Sussex, UK: John Wiley & Sons, 2012.
. Chapter 20: Qualitative research and Cochrane reviews. In: Higgins J , Green S , eds. Cochrane handbook for systematic reviews of interventions. Version 5.3.0 (updated October 2015): The Cochrane Collaboration, 2015.
. Service users’ perceptions of the Irish Child Protection System. The Stationery Office. Dublin: Office of the Minister for Children and Youth Affairs, 2008.
. Children and families experiencing domestic violence: Police and children’s social services' responses. London: NSPCC University of Lancashire, 2010.
; Researching Education to Strengthen Primary care ON Domestic violence & Safeguarding (RESPONDS). Final Report for the Department of Health, Policy Research Programme Project. Bristol: University of Bristol,, 2015.
. Safety and resiliency at home: voices of children from a primary care population: The University of Melbourne, 2015. Unpublished PhD thesis.
. Nurses' experiences caring for child victims of domestic violence: a phenomenological analysis. Texto & Contexto Enfermagem 2013;22:585–92.
. Psychiatric assessment of children and adolescents. Goldbloom R , ed. Pediatric Clinical Skills. 4th ed. New York: Churchill Linvingstone, 2010:2062–14. VEGA. Trauma- and violence-informed care. Briefing note. Secondary Trauma- and violence-informed care. Briefing note. 2016 http://projectvega.ca/wp-content/uploads/2016/10/VEGA-TVIC-Briefing-Note-2016.pdf. WHO. Update of the Mental Health Gap Action Programme (mhGAP) guidelines for mental, neurological and substance use disorders. 2015;72 http://www.who.int/mental_health/mhgap/guideline_2015/en/.
. Children experiencing domestic violence: a research review. Dartington: Research in practice, 2011.
. Domestic violence and protecting children: new thinking and approaches. London; Philadelphia: Jessica Kingsley Publishers, 2015.
. Effect of domestic violence training: systematic review of randomized controlled trials. Can Fam Physician 2014 60 e340–7.
. Department for Education. The Munro review of child protection: final report. A child- centred system: The Stationery Office Limited, 2011.
. Managing trauma in the workplace: supporting workers and organisations. Hove, East Sussex; New York: Routledge, 2011.
. Promising practices and model programs: trauma-informed approaches to working with survivors of domestic and sexual violence and other trauma: Domestic Violence, Trauma & Mental Health, 2015. http://www.nationalcenterdvtraumamh.org/publications-products/promising-practices-and-model-programs/.
. Trauma- (and violence-) informed approaches to supporting victims of violence: policy and practice considerations: Government of Canada, Department of Justice, 2016. http://www.justice.gc.ca/eng/rp-pr/cj-jp/victim/rd9-rr9/p2.html:. Hester M . et al. Children protection and domestic violence: findings from a Rowntree/ NSPCC study. In: Hanmer J , Itzin C , Quaid S , Wigglesworth D , ; eds. Home thruth about domestic violence: feminist influences on policy and practice: a reader. London and New York: Routledge, 2000:96-–112.
. Childhood experiences of domestic violence. London; Philadelphia: Jessica Kingsley Publishers, 2000.
. Children’s perspectives on domestic violence. London: Thousand Oaks, Calif: SAGE, 2002.
. Meeting the needs of children living with domestic violence in London. Research report. London: NSPCC and Refuge, 2011.
. Children exposed to domestic violence conclusions from the literature and challenges ahead. J Soc Work 2010;10:80–97. UN. Convention on the Rights of the Child. Treaty Series 1989 http://www.refworld.org/docid/3ae6b38f0.html.
. Towards a sociology for childhood: thinking from children’s lives. Buckingham; Philadelphia: Open University Press, 2002.
. World perspectives on child abuse: International Society for the Prevention of Child Abuse and Neglect. 2014.
. Mandatory reporting laws: their origin, nature, and development over time. In: Mathews B , Bross DC , eds. Mandatory reporting laws and the identification of severe child abuse and neglect. Dordrecht: Springer, 2015:25.
. VEGA briefing note on trauma- and violence-informed care. 2016. Contributors HLM and NW conceived the idea. GSF, NVL, EH, ES designed the study. NVL identified additional studies, carried out title and abstract screening, full-text screening, quality appraisal, data extraction, coding and synthesis. She reported the research and drafted the paper. EH, ES, GSF conducted double full text screening, data extraction, coding and quality appraisal. NVL, EH, ES, GSF, JRM contributed to the development of descriptive and analytical themes. All authors contributed to the interpretation of the data and five revisions of the paper. Funding This work was supported by the Public Health Agency of Canada, through funding to the VEGA Project (HLM, NW). HLM was supported by the Chedoke Health Chair in Child Psychiatry. NVL was also supported by the Avon Primary Care Research Collaborative and the National Institute for Health Research (NIHR) Collaboration for Leadership in Applied Health Research and Care North Thames at Bart’s Health NHS Trust (NIHR CLAHRC North Thames). Disclaimer The views expressed in this article are those of the author(s) and not necessarily those of the National Health Service, the National Institute for Health Research or the Department of Health and Social Care. Data sharing statement Data extracted from each of the 16 papers are stored in Word files and are available from the corresponding author on reasonable request. Raw syntheses of these data are stored in Excel and Word files and are available from the corresponding author on reasonable request.